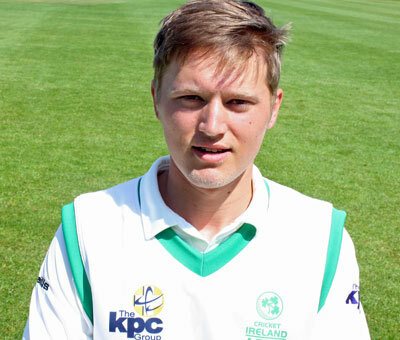 Jarred Barnes' five-wicket haul combined with Jack Tector's undefeated 94 helped Ireland Academy to an eight-wicket win against Bath in their tour opener. This was a very professional performance, with an excellent display on the field setting the tone for Pete Johnston's young charges. It was the performance of Barnes that caught the eye with the lanky South African born seamer extracting pace, bounce and movement from the pitch. Barnes has played in each of the three major Unions, and also represented Munster, the Warriors and Leinster Lightning in interpro action. He's switched to Rush this season and has really got his season up and running. He and Tyrone Kane (1-32) took early wickets, with the Merrion man finding some rhythm after recent injury problems. Bath regrouped with former Ireland A and U19 batsman Ben Ackland top scoring with 48, adding 66 for the third wicket with former Durham and Gloucestershire all-rounder Paul Muchall (38). 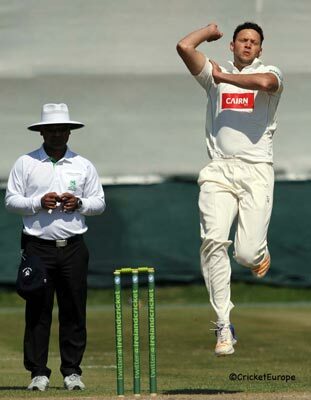 Brigade left-arm spinner Ross Allen (2-30) bowled exceptionally well, varying his pace while displaying excellent accuracy, clearly benefitting from his spell in Australia over the winter. Barnes picked up the last four wickets in quick succession as Bath finished on 185 all out. Gareth Delany (1-21) the other successful bowler. Delany fell early in the reply, but Jack Tector and Stephen Doheny added 53 in 59 balls, before Doheny fell for 21. Tector was joined by Muckamore's Marcus O'Riordan, with the former Kent Academy player (son of Irish parents) impressing in his first outing in Irish colours. He and Tector shared an unbroken stand of 121 in 110 deliveries, with Tector stroking 11 fours and 4 sixes in an undefeated 94 from just 80 balls. O'Riordan looked solid and stylish in his unbeaten 40 from 60 balls as the Bath total was passed with 20 overs remaining. At the request of the home side, they bowled their remaining overs, with Tector completing a century and O'Riordan just falling short, 93 not out when the overs finished. It's a switch today to T20 format, with Bath and Gloucestershire 2nd XI the opposition. Ireland are expected to make a number of changes, with Rory Anders and James Newland - late call-ups to the squad replacing David Delany (ill) and Max Neville (injured foot) expected to feature as well as Pembroke all-rounder Fiachra Tucker.